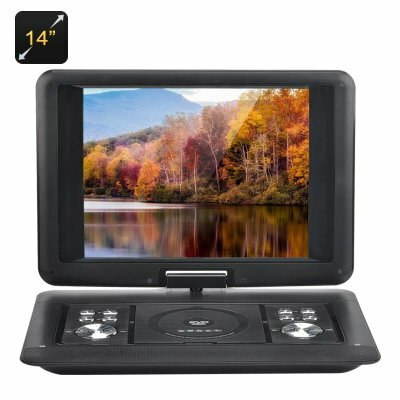 Successfully Added 14 Inch Portable DVD Player - Copy Function, 270 Degree Rotating Screen, Games, Copy Function to your Shopping Cart. Watch movies, play classic emulation games and get entertained on the go with the compact 14 inch portable DVD player. With a 270 degree swivel screen and the support of USB and micro SD, you will have lots of convenience of content options. The portable DVD player is a great gadget to grab along on a road trip to entertain the crowd in the back or use when taking a break from driving. You can take it along on a flight, train journey, a picnic or camping trip… anywhere you might need some light entertainment on the go. The DVD player comes with a 14 inch TFT screen with 1280x800 resolutions and features a 270 degree swivel for your convenience – so, whether you want to watch your media sitting up or lying down, you are sure to quickly and easily find the right angle. The DVD player supports a wide range of video formats: MP3, MPG, VOB, AVI, FLV, audio and JPEG. You can also use it to read e-books. Play content from DVDs, FM, USB and SD cards, watch TV or play those classic old favorite games. The portable DVD player comes with two 3W built-in speakers. So, in addition to great image quality, you will also have clear and crisp sound. The 1800mAh battery will ensure decent usage time and quick charging. With a nice and portable screen size, good resolution, support of various formats and content sources and copy function, this portable DVD player is a great choice for an inexpensive and multifunctional entertainment gadget. The 14 Inch Portable DVD Player comes with a 12 months warranty. Brought to you by the leader in electronic devices as well as wholesale portable DVD players..